View Through My Camera: 100th Post!! Well, what a milestone. This is the Sand Mtn. Photog's 100th post, who would have thought it? To all you out there who said it would never last, I guess I've shown you!! 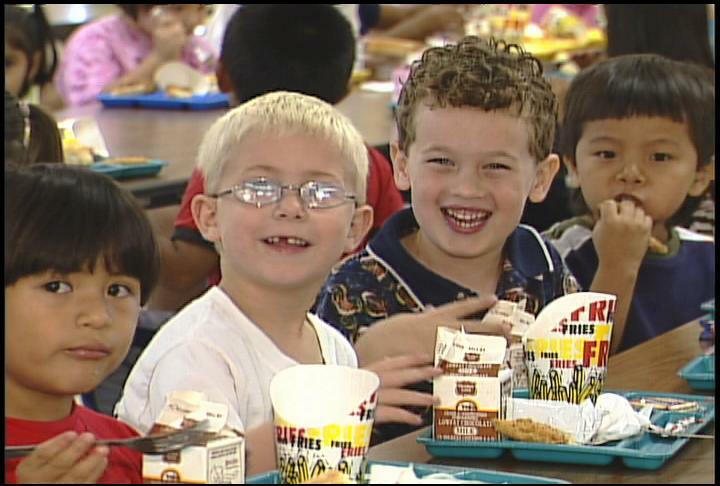 Going through some old tape today and found this clip of my son Forrest back in Kindergarten. He is the cute curly-headed one on the right. We were shooting a story about Crossville's lunch room crowding problems when we were paged out to the shooting death of Grant's police chief Verlon LeMaster. Which only goes to show how a day in the news business can go; one minute you're doing a cutesy story about school lunchrooms and the next minute you have to head out to a story about the death of a man you know and like. Ups and downs. That's what this business is all about. Congratulations on you 100th post! I am trying to just start mine up. I just posted my first comment on Dusty's blog a little while ago. He probably will not read until a month from now though the way he updates his blog. I am sorry I wasn't at Jemma's birthday party, I wish I could have gone. Hope to talk to ya'll soon. Congrats Brad! I knew you could do it! Hey, you haven't been over to Huntsville in a while to hang out with us. Do I need to find another free lunch for us? By the way, check out my blog!